Alexa is a search engine own by amazon. It might not be popular as a search engine, but it’s one of the industry standard of determining how much traffic a site is receiving. Simply put, it’s useful to list with them so they can start tracking your site’s traffic ranking, or maybe even help you get listed on search engine a little bit earlier. 3. You have two options to get alexa verify that you’re the real owner of the site. – by downloading a text file info.txt and uploading it onto your site root (ie. 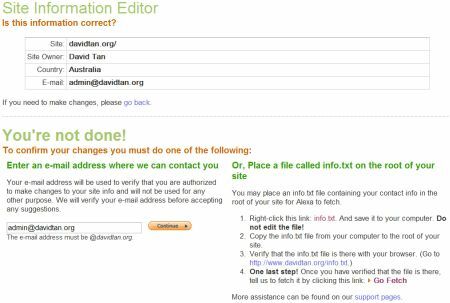 davidtan.org/). You will need a ftp client to do the uploading. 4. I selected the second option as i think it was faster. If you had chosen the first option, you might have to wait for an email sent by Alexa, and press a link to verify that you are really the owner of the site. I used the second option just like you..and it was successful! Thank you, It works for me.